The Hindi movie Thalaivan Irukiraan is to be remade in all the southern languages like Tamil, Malayalam, Telugu and Kannada. In Tamil and Malayalam it has be finalized as Kamal and Mohanlal combo whereas in Telugu it’s going to be a Kamal Venkatesh combo. The original story is all that happens over a couple of hours on a Wednesday in the career of city commissioner of Police, on the eve of his retirement. It starred the stalwarts like Anupam kher and Naseeruddin Shah. In all the four languages Riyas Khan will play an important role as a policeman. In Tamil the heroine is finalized as Trisha. This would be really comforting to her, as the big project Marmayogi with Kamal has been shelved now for some production issues. 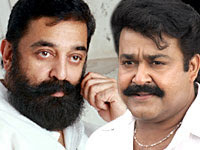 We believe on the undoubted performance of both the legends Kamal and Mohanlal. But let’s wait and watch the box office collection of the movie.